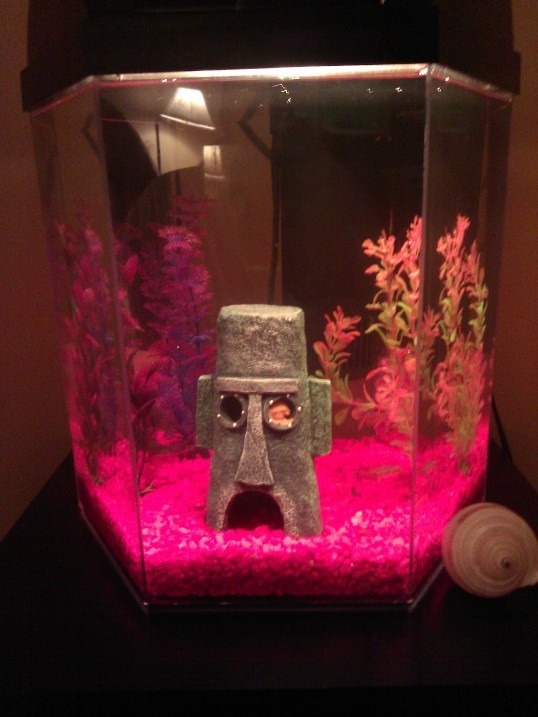 This is the smallish fish tank that lives at la casa de Puddin. The Puddinette and I tell ourselves it’s for the kids, but to my knowledge, they don’t even know how many fish are in there anymore. You can take a few guesses as to who feeds the tanks inhabitants on a regular basis, as well as who tends to manage things like cleaning the thing when the level of algae growth sends the whole environment to the brink of a biohazard. That was unfortunately the condition this past weekend, owing to an over abundance of uneaten fishy flakes (apparently my tetra are on one of those idiotic pre-Thanksgiving food fasts), a filtration system that stopped working without giving us the common courtesy of calling in sick, and the world’s laziest bottom feeder, Charlie the Lazy Catfish. Being dutiful fish parents, the Puddinette and I then went about cleaning out the aquarium and replacing all the plants and décor with bright, shiny new stuff and a whole quarry of brightly colored pebbles. Besides, when you’ve invited your entire family over for Thanksgiving, everything has to get a thorough cleaning: the kids, the carpets, the dog, the kitchen, and, yes, even the pescatorial habitant. At any rate, fast forward twenty-four hours, and I made a bleak discovery. There seemed to be a casualty following the Great Pre-Thanksgiving Cleaning. Our previously hard-working tank snail, No-Name, was floating, listlessly at the top of the water. It seemed the worst had happened. So I did what you do when these unfortunate moments arrive in life, I got out the net and started fishing for our dearly departed No-Name. But when I snagged him (or her…or it, maybe?) I noticed that although still pretty much gross and dead-looking, the creepy little monster seemed to have sucked some of itself back up into its shell. My gut instinct said to carry on with the plan and proceed with Operation Flush It. We had, after all, just put a fair amount of effort into cleaning up, and the last thing I wanted was a dead tank snail funking up the joint. But I couldn’t shake the idea that maybe, just maybe, some sort of fish tank miracle was in process. So against my better judgement, I dumped No-Name back into the tank and watched him float away an the new filter’s output current. A day, I promised myself. He could have a day, no more. And, lo, sometime between last night and this morning, the miracle was made real. No-Name rose from the dead. Well, or we have a zombie snail, one or the other. As if the reincarnation of the family snail wasn’t quite creepy enough, tonight I made an even more gruesome discovery. Not only is No-Name alive, he’s been busy. 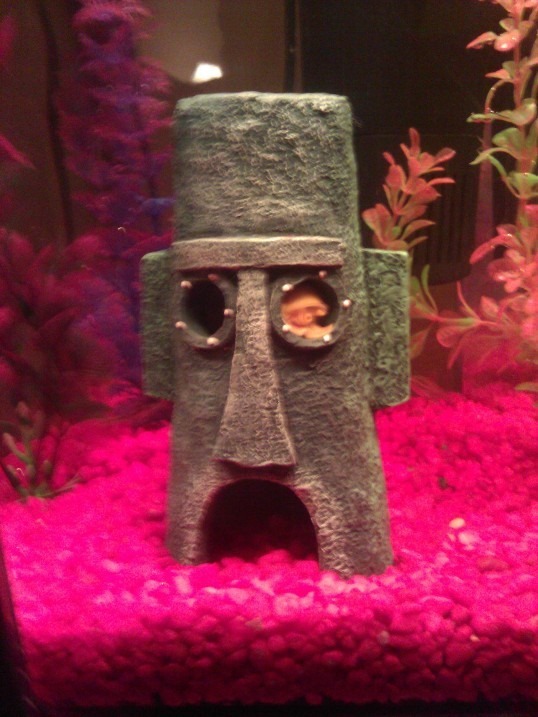 Oh, look Squidward’s house appears to have something in the eye. Behold! No-Name, who shall henceforth be know as either Lazarus or, well, Gary (because, duh), has found a place to call home. 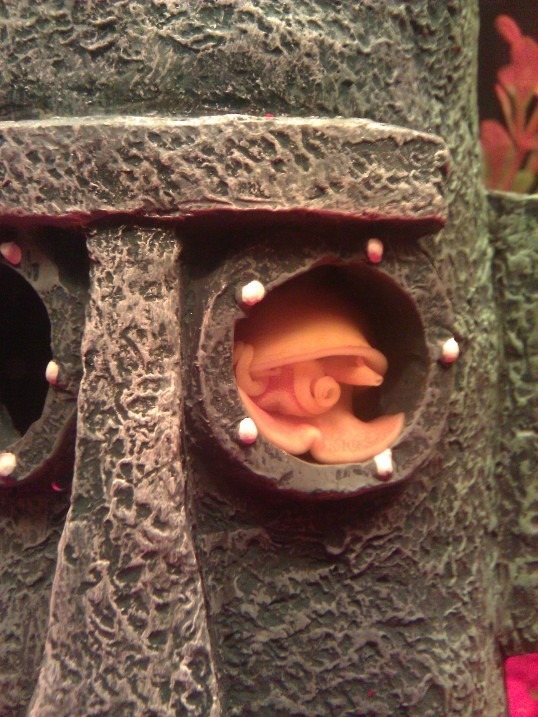 Just between you and me, though, if finding your previously dead snail kicking it in your aquarium totem’s decorative face holes doesn’t make your Monday evening creepy, shiver-inducing, and yet kind of all-around awesome, you need to get your pulse checked. Oh, also, look for shots of Puddin’s Death-Defying Healing Aquarium Waters everywhere, including eBay, Craig’s List, and shameless traveling huckster. Priced to sell at a mere $100 per vial. Coming soon! We now return you to your regularly scheduled non-undead pets.